The Malvales is a widely-distributed order containing 9 families and 6000 species of dicotyledenous flowering shrubs and trees with a few herbs. The order takes its name from the (Mallow Famly - 4000 species). Leaves are generally palmate and sepals joined. Malvaceae are the source of specialised woods e.g. Ochroma (balsa), Tilia (lime, linden) and important agricultural crops, including cotton and kapok. The family Dipterocarpaceae includes many tropical species of valuable hardwood trees. The cacoa tree Theobroma cacao has been cultivated for at least 3000 years. Its seeds which contain theobromine are fermented to produce cocoa, which is further processed to chocolate. Kola nuts Cola are an ingredient in well-known soft drinks because of their high caffeine content. Okra pods Abelmoschus esculentus are widely grown, and an important constituent of the Cajan dish "Gumbo". The achiote tree Bixa orellana is the source of the colouring agent anatto. Several general from the Malvales are of horticultural merit including Daphne, Hibiscus and Alcea (hollyhocks). Cistus (rock roses) are frequently cultivated as ornamentals for the sunny rock garden. 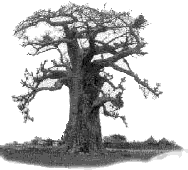 Succulent trees (Baobab) are found in the Bombacaceae which is closely related to the Malvaceae and is included within the latter family in recent taxonomic revisions. The swollen trunks of Baobabs store considerable amounts of water.